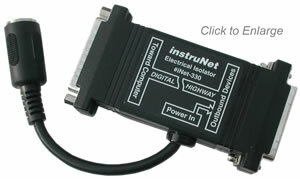 The Model 330 optical-isolator manufactured before November 2010 is referred to as "i330 Revision 1". It is identical to the newer Revision 2, except power is cabled differently, as described below. The i240 USB controller requires two i312 power supplies when working with the i330 Rev 1, since each side of the i330 optical isolator requires power, as shown below. 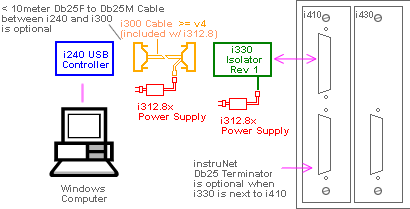 The internal circuitry of the i330 is summarized below.